Hello! I’m Karl Pillemer, a professor of human development in the College of Human Ecology at Cornell University, and Professor of Gerontology in Medicine at the Weill Cornell Medical College. People from across the country in their 70s and beyond shared their wisdom for living. 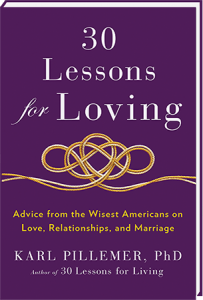 Their advice ranges from how to be happy on a day-to-day basis, the secrets to a successful marriage, tips on raising children, ways to have a fulfilling career, strategies for dealing with illness and loss, and how to grow old fearlessly and well. 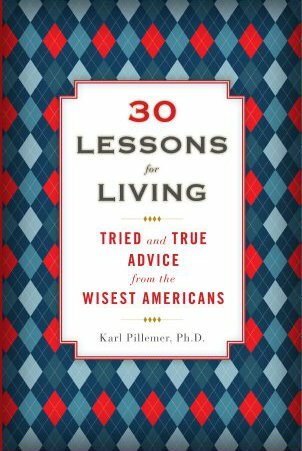 My first book on the project, 30 Lessons for Living: Tried and True Advice from the Wisest Americans, was published in 2011. It was named to the list of “Best Self-Help Books of 2011” by Library Journal. 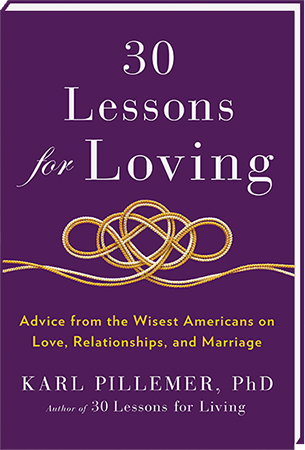 This year, I published a second book, 30 Lessons for Loving: Advice from the Wisest Americans on Love, Relationships and Marriage. The lessons are grouped into categories on the left-hand side of the page. If you’re looking for advice on a specific topic, you can go directly there. Thinking of tying the knot? Click on “Love and Marriage?” Need motivation to get in shape? Click on “Health.” You will be taken to all the elders’ lessons on the selected topic. You can search for a specific topic using the search function. So if you are wondering what the elders say about something more specific than the topics provided, search away. Add your own (or your elders’) lessons! Click on “Share your Lessons” at the top of the page, and let us know your lessons for living. If your older friends and relatives aren’t tech-savvy, type in their lessons. We’ll use them as we continually add the advice of the elders to the site. And of course, you can just start reading on the main page, where new lessons are posted several times a week.